Papier-mâché ( UK: /ˌpæpieɪ ˈmæʃeɪ/, US: /ˌpeɪpər məˈʃeɪ/; French: [papje mɑʃe], literally "chewed paper", "pulped paper", or "mashed paper") is a composite material consisting of paper pieces or pulp, sometimes reinforced with textiles, bound with an adhesive, such as glue, starch, or wallpaper paste. For the paper strips method, the paper is cut or torn into strips, and soaked in the paste until saturated. The saturated pieces are then placed onto the surface and allowed to dry slowly. The strips may be placed on an armature, or skeleton, often of wire mesh over a structural frame, or they can be placed on an object to create a cast. Oil or grease can be used as a release agent if needed. Once dried, the resulting material can be cut, sanded and/or painted, and waterproofed by painting with a suitable water-repelling paint. Before painting any product of papier-mâché, the glue must be fully dried, otherwise mold will form and the product will rot from the inside out. 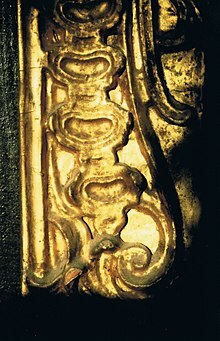 Starting around 1725 in Europe, gilded papier-mâché began to appear as a low-cost alternative to similarly treated plaster or carved wood in architecture. Henry Clay of Birmingham, England, patented a process for treating laminated sheets of paper with linseed oil to produce waterproof panels in 1772. These sheets were used for building coach door panels as well as other structural uses. Theodore Jennens patented a process in 1847 for steaming and pressing these laminated sheets into various shapes, which were then used to manufacture trays, chair backs, and structural panels, usually laid over a wood or metal armature for strength. 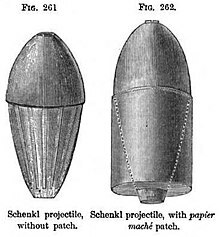 The papier-mâché was smoothed and lacquered, or finished with a pearl shell finish. The industry lasted through the 19th century. Russia had a thriving industry in ornamental papier-mâché. A large assortment of painted Russian papier-mâché items appear in a Tiffany & Co. catalog from 1893. Martin Travers the English ecclesiastical designer made much use of papier-mâché for his church furnishings in the 1930s. 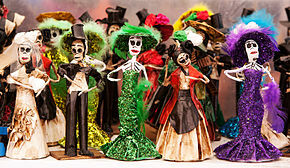 Cartonería or papier-mâché sculptures are a traditional handcraft in Mexico. The papier-mâché works are also called "carton piedra" (rock cardboard) for the rigidness of the final product. These sculptures today are generally made for certain yearly celebrations, especially for the Burning of Judas during Holy Week and various decorative items for Day of the Dead. 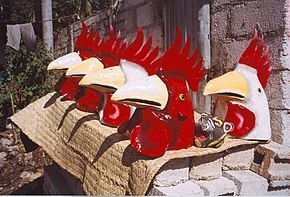 However, they also include piñatas, mojigangas, masks, dolls and more made for various other occasions. There is also a significant market for collectors as well. Papier-mâché was introduced into Mexico during the colonial period, originally to make items for church. Since then, the craft has developed, especially in central Mexico. In the 20th century, the creation of works by Mexico City artisans Pedro Linares and Carmen Caballo Sevilla were recognized as works of art with patrons such as Diego Rivera. The craft has become less popular with more recent generations, but various government and cultural institutions work to preserve it. Papier-mâché is an economic building material for both sets and costume elements. It is also employed in puppetry.